The Wolfman is a remake of the Lon Chaney 1941 film of the same name. This time around we have Benicio Del Toro in the lead role as Lawrence. After the death of his brother, Lawrence returns from New York to the stately home he grew up in. Of course, his brother’s death is not the only disaster headed his way. 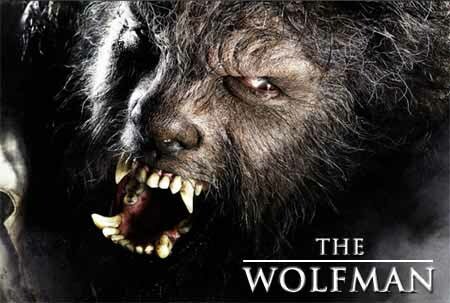 The remake of The Wolfman was first announced in 2006. In the four years that passed before the movie made its way onto out screens, film suffered delays and setbacks at almost every turn. The main effect this has on the film is on it’s tone. What could have been a delightful gothic horror film, along the lines of Interview with the Vampire became confused. Since the film was announced we have been inundated with the romantic sort of horror. Stephenie Meyer, True Blood and The Vampire Diaries, I am looking at you. For this reason, it seems that an almost wholly unnecessary romance between Lawrence and his grieving sister-in-law, Gwen (Emily Blunt) has been thrown into the plot. It also seems that a whole lot of blood and guts were sprinkled through the film, to try and bring in the gore fans. Another problem with the movie is the criminal underuse of most of it’s actors. The film centres around Del Toro, and he performs well enough in a role that wants him to brood and be monosyllabic. The other actors, Anthony Hopkins, Emily Blunt and Hugo Weaving, are seen very little on screen, causing one to wonder why such well known names were cast in such tiny and unchallenging roles. That said, however, there are some redeeming moments in the film. The chases through the gypsy camp and, later, the streets of London are great set pieces that show off the look of the film. Another great moment is Lawrence’s transformation in the asylum. He is paraded in front of arrogant doctors who believe him to be insane. When the full moon is revealed, that all changes. A proper scare, well executed. These moments are not enough to save the film, however, and while Del Toro delivers as the Wolfman, we all knew he could do it anyway and his performance does not surprise us. Overall, a mediocre film that could have used it’s cast and story a whole lot better. Disappointing.